Business | I ... reach!! Career – center piece of life! G can only be for Google in #AtoZ challenge. Considering how much knowledge i have gained from it and how much easier it is now to gain knowledge about anything in the world with just a simple question, Google tops the list of my life influences starting their names with letter G.
Considering Google as a company was established in September 4 1998, Google is still a teenager!!! The amount of disruption in brought into the lives of millions of people is amazing. From starting as a simple web crawler company, to the diversified company it is today, the journey is amazing. For the sake of this post, when i checked the Google range of products, i was totally flabbergasted. I hardly have been using only few of them and i think my life influences is Google. Will i be able to comprehend the breadth of Google in my lifetime? In my order of preference, Google search, Google mail, Google maps and Picasa stands the top….obviously my horizon is yet to expand to include and experience all of Google!!! Google – SALUTE you!!! Women forums in IT industry – hype or real? Over the years in IT industry, I hardly saw any situation where women can operate differently because they are women. When we assess someone’s capabilities to fit into IT industry, we look for standard traits – Zero-defect project deliveries, vast domain knowledge, excellent communication and team management skills, client-facing capabilities …….. all these are gender-inclusive expectations in our industry. Research has also proven that women have a higher EQ (Emotional Quotient), which in today’s corporate world is rated higher than IQ – this actually gives women an edge over men in problem solving. The recent trend analysis also concludes that corporates which have women as part of senior management have done much better than those who do not. Ideally, with the above two facts, the women workforce in IT industry should be at a minimum of 50%. In reality, statistics show that women workforce ranges between 25% to 30% and less than 15% of senior management in most global IT companies. The reason for lesser percentage of women is mostly attributed to women’s extended role in family and childcare – this is true globally. Surveys have concluded that in households where men and women work, women still do twice as much housework and thrice as much childcare. So, what can women do to with the support from these forums?? KNOW YOURSELF – “As a man thinketh in his heart, so is he” – James Allen. With understanding themselves, comes the wisdom – with wisdom comes the personal power. BE AWARE AND EMBRACE CHANGE – Continuously challenge their limits – every archiver (Gender inclusive!) has done this! We need a whole lot of committed change agents who can make this change……and be part of the change!! Till then, the debate on the need for women’s forum will continue…and probably the cheeky lot will continue to check about the need for men’s forum!! The place of choice was Ramagiri(Ramadeverabetta) in Ramanagaram, around 5o km and the plan was a day long session of trekking, rappelling and zip line. Ramanagaram is famous from the film industry perspective also – Hindi movie “Sholay” and English movie “A passage to India” was filmed in this location. We were guided by Adventureworx, a professional company specializing on outdoor adventures. 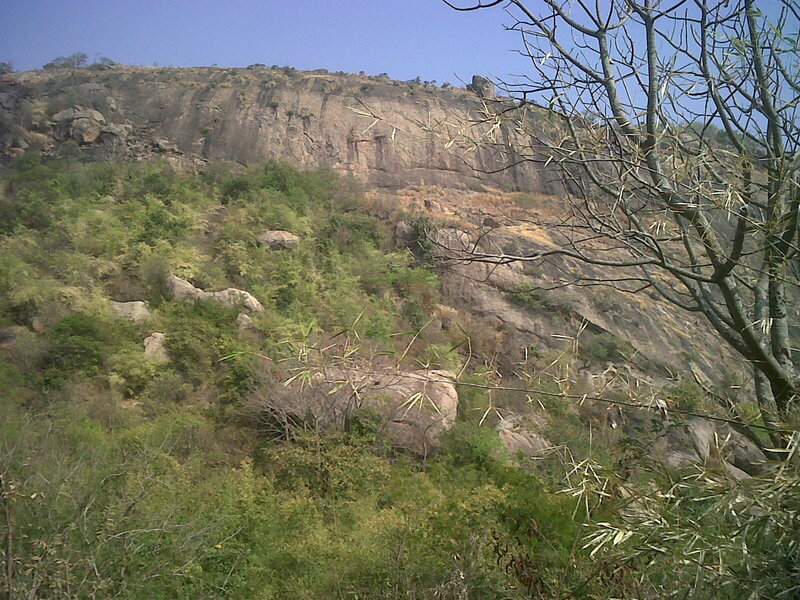 The rocks are visible from the Bangalore–Mysore road on the right side (when you drive from Bangalore), beyond Ramanagaram town. We had a leisurely breakfast and chose the tough route (interesting route as per the guide!). It was a tough climb, though we made it in couple of hours. We reached the top and then came around to the Ram temple. The water from the small water body near the temple was so fresh and refreshingly cool. From the temple, we took the steps downs. As always, the trek was refreshing, stretching the muscles and made my day. It was very unique experience to have a dog from the village following us and making sure that the last person of the group has crossed the tough stretch of the climb. The guide said that the dog always ensures that the climbers are escorted – it was some sort of a spiritual experience to look at the dog’s eyes and see that determination to accompany the trekkers. With beautiful sights on the way (it was very unique to see the tree growing on the rock top), it was a well spent morning. Post lunch, we tried zip line and rappelling. It was first time experience. While zip line was more of a fun, rappelling was a test of one’s mental strength, confidence and focus. The trick was -breaking away from the mental fear and taking the first step in rappelling – believe that you are completely protected (ofcourse, the critical thing for any rock climbing is the high quality safety gears – these were provided by adventureworx to us, I saw all of them were imported gears, mostly from Italy). It was well spent day and it was worth the decision to go!! 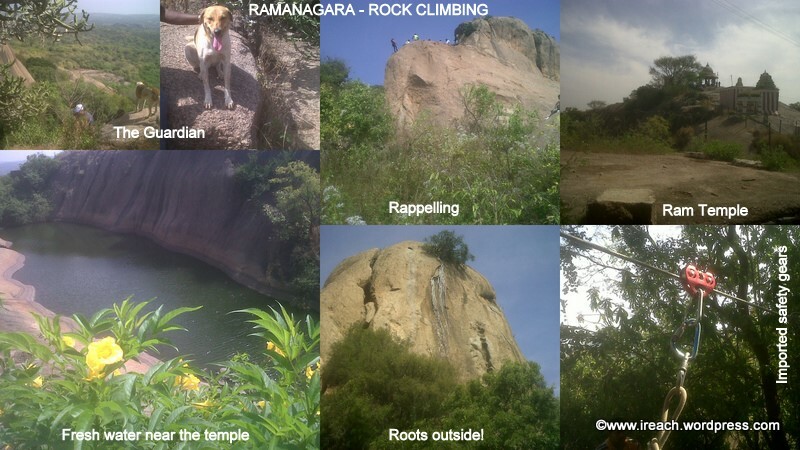 Ramanagaram is recognized as an international rock climbing site and we spotted many foreigners trying their rock climbing skills here. Grades here are between 5.8-5.11 American is what I learnt later (you can read about rock climbing grades here). Whenever I try to track the train track between Bangalore and Chennai in Google Maps, the option does not come up………Rome2Rio gives the train route also!!! This site is established by a technology startup based out of Melbourne, Australia. The current version searches worldwide flight schedules, European, North American, Indian and Chinese trains, North American inter-city buses, driving and ferry routes. The public beta version was launched in April 2011. Capacity Leakage?? – Youth in India! It was one such meeting yesterday – he is in his early thirties and has been in IT industry for twelve years now and is moving out to purse his management education in IIM C – relocating with his wife and two little kids to a new city, leaving the plum IT job he had!! Knowing his background, I was so happy for him….Happy that he is making the right decision and moving towards his goal in life!! He left me with a thought – if it is possible for him….why not for all? – what is that I can do to influence my circle to ensure that they are aware of their capacity? Lot to think and implement!! ……. Vasan Eye Care – Leadership and Management! Effective leadership is putting first things first. Effective management is discipline, carrying it out – Covey. So, when we went to the Vasan Eye Care center in Vadapalani, Chennai – I was not expecting to see Covey in action!! Starting from the security, receptionist, ward nurse and doctors – all I saw was the focus – CARE team in action….they have analyzed the psyche of patients, the psyche of attendants and established the processes…….!! The experience was very unique for me – while I have seen the multinational hospitals, system and process – what was unique here was the human touch to everything – while the scale of operations is much smaller compared to a huge hospital, the focus to ensure the implementation of their USP – “WE CARE” was amazing!! Later I learnt about Dr.A.M.Arun and read through their vision, mission and values….nothing so unique for the story of a successful entrepreneur. What was unique was the business model which they implemented across this chain of hospitals. Value proposition – establishing the CARE TEAM, which also doubles up as their USP. I feel there are probably excess staff – but may be very specifically trained to do specific jobs – in an average eye clinic, I have mostly see ophthalmologist handling the sensitive testing instruments, but in Vasan I saw trained technicians doing that work – while it is a guess, I think Vasan gets to have more staff on their roles at probably low-cost as they are only trained on specific functions. Market Segment – Vasan seems to target the upper middle class market segment – who are affluent enough to spend money, but want to ensure that there are no frills – spend enough for the necessity!! Look at the location of the hospital chains they have picked….their ambience is something which is not of a five-star status, but of a decent well-kept hospital. Position in Value Network – Vasan probably is feeding the need for a neighbourhood eye clinic and hospital – replacing the individual eye clinics and the super-speciality huge eye hospitals. In the value chain, they are probably all over – adding value as a one time eye clinic visit, to the high-end of cosmetic eye treatments!! Revenue generation and margins – proof is in the pudding!! they are planning their IPO! Management lessons in Maaribetta Trek!! As part of our team’s 2011 annual goal setting/team bonding sessions in Bangalore, we had a trekking session in Maaribetta day before yesterday (Saturday). It was a team of 22 who came from all over India for the two-day sessions! 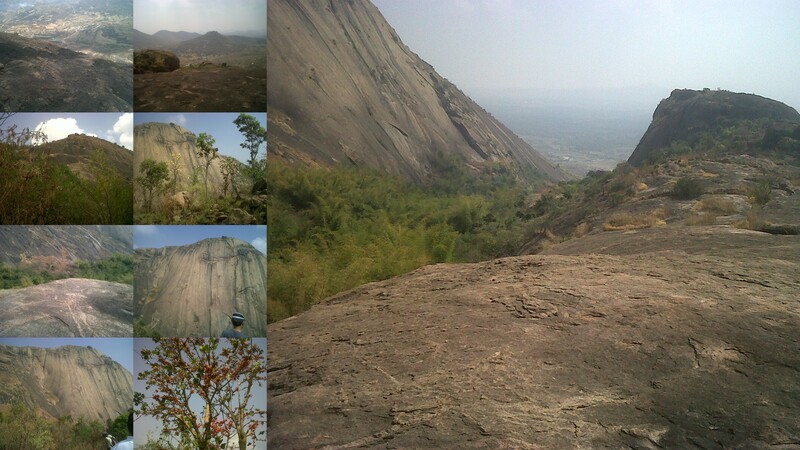 Maaribetta or Banathamaaribetta is a little known adventure destination, near Bangalore. We took the help of Woody Adventure Inc, an adventure event management company (Thank you, Raj! You referred the right organizers) in Bangalore. 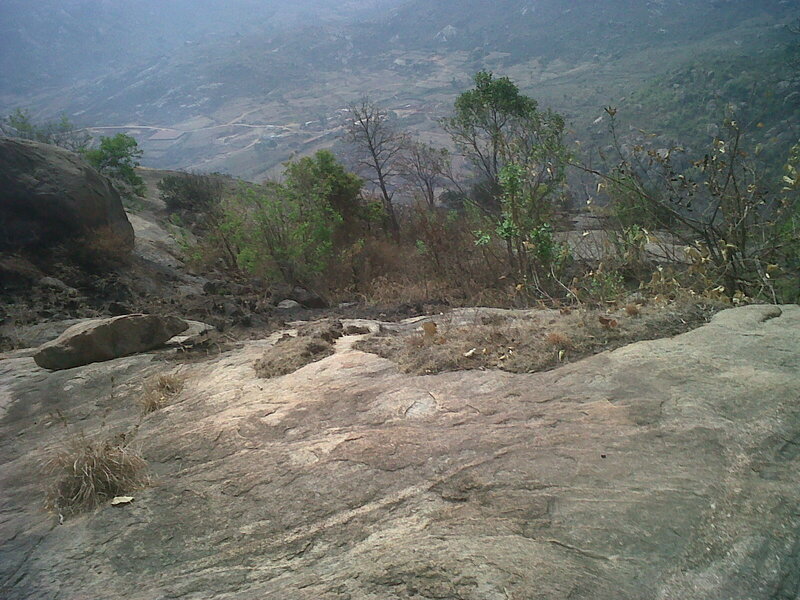 The hill is located 55 km from Bangalore near Kanakapura and 6 km on the Ramnagar road. The trek through the rocky slopes, thorny bushes made the trip very challenging and interesting. This place is also an ideal destination for photography – actually couple of eligible bachelors ensured that they captured their pictures in Maaribetta background for their matrimonial picture portfolio 🙂 🙂 !!! The group was a mix of male/female and young/old. While couple in this group had experienced trekking earlier, for most of the participants, this was the first time trekking experience. Mr.Muniraj was our guide from Woody Adventure, and was ably supported by Sangeeth, a 3rd year electrical engineering student from BMS engineering college, Bangalore (he said, it was his part-time job!!). Through the entire trip, Mr. Muniraj was giving us lot of instructions and I found that there were many management lessons in them to remember and implement – read them below! We reached the foothills of Marribetta at around 9.45 am (I have to commend the skills of the driver who drove through those muddy village narrow roads). Mr. Muniraj requested us to form a small circle and addressed us – “ We have two options for this trek. One – easy but takes longer time and the second one is moderately difficult but takes less time. I will suggest the second one. We have taken even 5th grade school children on this and they made it easily. Let me know your choice”. There was hustle and bustle with the team, when three of us opted for the second moderately difficult option, there was a sudden wave and everyone (even the ones who was skeptical about the whole concept of trek) opted for it. Lesson 1 – Give the options to the team. Set expectations – state the real scenario. Lesson 2 – When the leaders make the decision and set an example, it becomes easier for the team to follow. Lesson 3: If your goal is on something high, keep your requirements minimal. Less baggage, more comfort. We started walking and it was indeed a memorable one. Mr.Muniraj was so knowledgable and kept the team motivated through the trek with his instructions. While we did not spot any wild animals, he did show us the droppings/footprints of elephant, bear, panther, rabbits, porcupine, antlions. He also showed us the trees which are dangerous (itchy trees) and the antiseptic plants. He insisted that nature is beyond us and if we understand it, we will become very humble. Lesson 4 – Understand the big picture. You will know who you are. At one point, I was almost stuck – perching on a steep rock, not sure of my next step. The guide saw me and said – “Feel the rock and focus on your steps”. It just hit me…….how true…..all I need to do is to focus on my next step and not on anything else. Lesson 9 – Focus on your next steps. We had a wonderful time and came back as a satisfied team with more learnings to operate as a team!! ps- This post is my entry for the ‘Cleartrip My Purpose‘ contest in Indiblogger. If you enjoyed this post, you can vote for this in Indiblogger. Next Gen India! Thumbs Up!! I continue to go through my own share of doubts – what is next Gen India going to do? As part of parenting a teenager, there are times where I continue to compare my teenage days with the current teenagers – current Gen X has a lot of options and they have more access to anything they want – INTERNET is a big power……! I sometimes have detested their ‘know-all’ attitude, but I also acknowledge that they know more than what I knew at their age – but, still there are doubts on how they are going to fair in life! When I listened to the two presentations by startup entrepreneurs, I was pretty convinced to give a Thumps up to Next Gen India!! 2. INTERVIEW STREET – while I was pleasantly surprised with Deepak, it became a double ‘damaka’ with Vivek . Yeah, it may sound crazy…but it feels like Oscar! I am referring to the long service award which I got from my employer – 10 years in the same organization is indeed a milestone. Yes, what is striking is that all these long service awardees have put in the best of their career years into this organization – this is amazing!! I am sure if any of the long service awardees get their biographies done, this period in our life time will definitely be a focused coverage!. All have been together, learnt many things, grown, been loyal, dedicated, etc……..
Professionally and personally I have matured a lot in these last 10 years and my organization has a very big role to play in my growth – when i say organization, it goes without saying it is the people who make the organization. To close, i quote these lines from ttrangarajan -” Happiness is in small things! Success is in big things” and these 10 long years in this organization gave the opportunities for small things and big things!! God bless! 🙂 🙂 Makes me feel wonderful about this milestone! Fun@Work – Everlasting four liners!! It was 12.40 am…. i get a feeling that all the teams at work are lost in galaxy! !…….probably this feeling is the after effect of two consecutive 13-14 hour grueling work days and my hurting throat infection…handling tiring telecons, (mis)communications, egos!!……. and then suddenly i am gushing to list these four liners….. honestly, at the end of this listing exercise, I felt more positive about work….i could see the fun part of it……..all functions indeed knew what needs to improve(in other functions) for them to perform !!! Probably we are on the right track! !